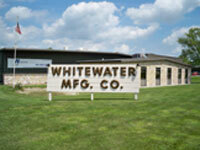 At Whitewater Manufacturing Co., an essential part of our quality management system is a fully integrated, real-time information system that delivers the exact status of every job. In addition to monitoring internal functions such as labor and accounting, this software system includes a complete Material Requirements Planning (MRP) package to track orders and receipts of raw materials, as well as production schedules and delivery confirmations of finished goods. The result is a complete, accurate, and instantaneous response to customer inquiries. Whitewater Manufacturing’s Quality Steering Team is committed to the development and implementation of Continuous Improvement practices and procedures that enable us to meet and exceed customer expectations and drive customer success. These practices are supported by continuing education and training, as well as continuous reinvestment in capital equipment to keep us ahead of the curve. Ultimately, our own success will be measured by the satisfaction of our customers.